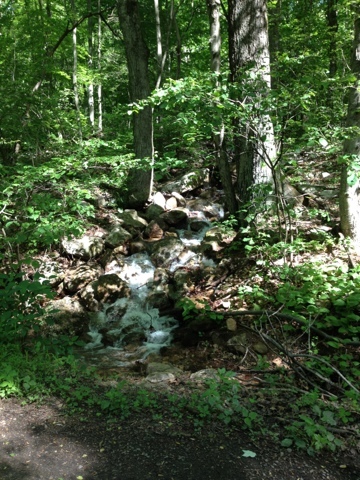 Wow, the scenery was beautiful with the trees, the creek nearby, a small waterfall, and two deer crossed our path. It was a very nice change from running in the city. But I was surprised in how much of a workout it was. Pushing Lil Man in the stroller was a challenge. I was running with a friend and we traded off pushing. But still it was tough. Also there was just enough incline to make my muscles scream. And it wasn't screams of joy either. But we did it. 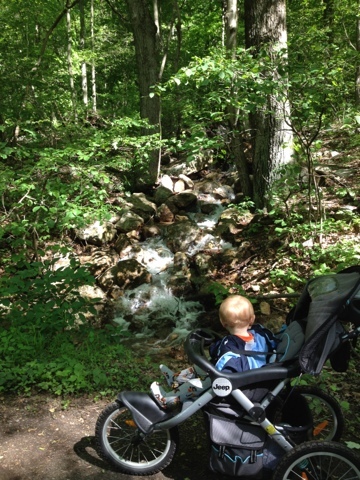 We stopped a few times to enjoy the scenery, snap some photos and adjust Lil Man in the stroller. But overall a successful first 6 mile trail run.